Lena Silk - serving you and your family with Knowledge & Excellence! 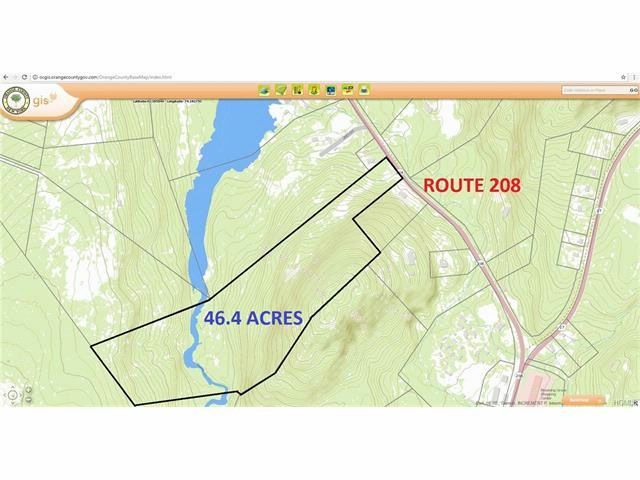 This is an exceptional 46.4 acre parcel atop a natural wonder located in South Blooming Grove. The land is open, partially wooded, bank run of shale and beautiful stones for landscaping. The views and the serenity of this property are priceless. The rocks create a natural wall as you ascend to the pathway atop its plateau. Road frontage on 208 is approximately 220â?? and it is approximately 3 miles to the Route 17 entrance. Build your secluded Frank Lloyd Wright country home here, itâ? ?s perfect. ONE HOUR TO NYC. Woodbury Commons, cultural attractions: West Point, Storm King Art Center & Hudson River Restaurants. Stewart Airport, NYC Express Bus & Metro North Trains to NYC, nearby.